Bubblegum Bandits: An Interactive Categorizing Game! I LOVE a good categorizing game! Oh, and a good interactive game! 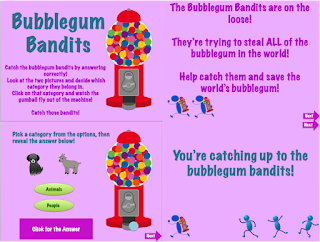 I'm excited to bring you "Bubblegum Bandits", my newest activity! Basically, the player is presented with two pictures in the same category and given two choices. Click the box and reveal the answer to make the bubblegum go wild! Catch up to the bubblegum bandits and save the world's bubblegum! I like this activity because it's a great introductory and follow up activity. Only having a field of 2 is also a clearer way of working the activity. You can find this activity HERE on TpT. Happy categorizing!